Mini Sleeve CD Shop MyMusicFix!! 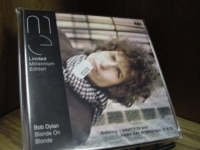 "Bob Dylan, Blonde On Blonde LImited Millenium Edition"
Made In Germany - Replica LP packaging Long Out Of Print - Extremely Rare Voted the #9 rock & roll album of all time. This 1966 landmark double LP (2 cd) set is considered by most Dylan-philes as his masterpiece. By blending a rich tapestry of blues, country, folk and rock, "Blonde On Blonde" is an album of limitless depth filled with lyrical and musical revelations. Recorded in Nashville with Al Kooper and Robbie Robertson, as well as other fabulous session players, the album is filled with cutting guitar riffs and liquid organ fills. Songs like "Rainy Day women #12 & 35", "Visions of Johanna", and "Just Like A Woman" are just a few examples of why it remains to this day as a classic.